A recent usage study commissioned by USA Pears showed that on average, pear consumers purchase six or more pears in bulk when shopping, with 46 percent eating them as mid-morning and afternoon snacks. Pears are often considered best eaten fresh and just-sliced, making them a perfect partner for wholesome, simple snacking – think sliced pears atop whole-grain toast, wrapped with prosciutto, dipped in nut butters, or partnered with blue or aged, hard cheeses. even replace meals, a pear’s juicy, subtle flavor pairs well with protein-filled nut butters or almonds and walnuts. And its gentle acidity is a bright match for richer companions, like cheese and cured meats. Pears are a nutrient-dense, fat free food, an excellent source of fiber, and have vitamin C for only 100 calories per serving. 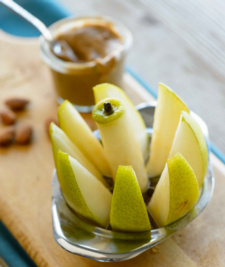 Pear snacking is healthy and can help fill you up and keep you satisfied. When the weather is warmer there will be a greater number of high-quality fruit at a “snackable” size – perfect for throwing in a lunchbox, purse or string bag on the way out the door. Pears are a perfect partner for wholesome, simple snacks. Think outside the cracker box.